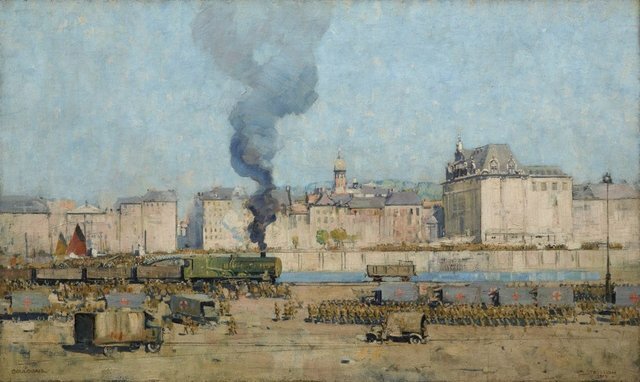 Arthur Streeton was appointed an official war artist by the Commonwealth Government of Australia in May 1918. He arrived in France shortly after his appointment and was sent to a training school at Boulogne where he was taught how to use a gas mask. Streeton was employed to produce at least 25 drawings and watercolours, and one large painting of a battle scene or other Australian Imperial Force involvement. In just over six months he was prolific, producing numerous drawings and watercolour studies on site, and completed works in his studio in London. This picture depicts troops marching in the centre of Boulogne. Although many of Streeton’s war paintings concentrated on the landscape, this picture represents the machinery of war, both human and mechanical. Signed and dated l.r. corner, brown oil "A STREETON/ 1918 -".